I’m Julianna Horiuchi, an undergraduate student from the U.S. studying Environmental Science and Food Systems at Northeastern University in Boston, Massachusetts. I joined the Sustainable Places Research Institute (PLACE) as a research assistant for the spring 2018 term, moving to Cardiff for five months to dive headfirst into sustainability research. Private food certifications like Fairtrade and Rainforest Alliance have emerged as tools to encourage sustainable farming practices, mitigate harmful social and environmental impacts of agriculture, and offer consumers responsibly-produced alternatives to conventional food products. I worked with Dr Angelina Sanderson Bellamy on the CERTAIN project, a body of research examining the social, economic, and ecological impacts of food certification criteria with the ultimate goal of creating a toolkit to evaluate private certifications. My research was twofold: I, one, compiled a literature review exploring food certifications as private governance mechanisms and the implications of such, and two, conducted a spatial analysis examining the ecological impacts of a private certification for banana farms on Costa Rican forests. Private governance mechanisms have become established fill-ins for government policies in response to rapid globalization of firms and supply chains. I explored the implications of food certification schemes as one of these mechanisms, regulating food safety—and more recently social and environmental impacts—through establishment of private standards and verification by audit. These standards allow retailers to reduce costs and boost reputations, but can make safe and quality food unaffordable for low-income consumers, and exacerbate inequalities between large farmers able to invest in certification requirements and smaller farmers forced into less profitable markets. Private certification schemes also raise questions of democratic legitimacy without state contribution, and operational independence of competing certification bodies, while still maintaining a degree of government dependence. To address concerns of legitimacy and inequality, not only can private standards evolve to incorporate greater producer participation (especially in developing countries), but the role of the state can be expanded in co-regulation, establishing public-private partnerships for more inclusive and democratic governance of an increasingly global agri-food system. My second study evaluated the effectiveness of one such certification, Rainforest Alliance (RA), in conserving forests in the major banana-producing region of Costa Rica. Through spatial analysis of regional forest gain and loss allocated to closest farm points, tree cover gain and loss were compared in and around RA-certified versus non-certified farms. The study found only tree cover loss through 2012 to be significantly less in RA farms, but with a small effect size and an insignificant difference in tree loss once extended through 2016, and no significant difference in tree cover gain between RA and non-RA farms. 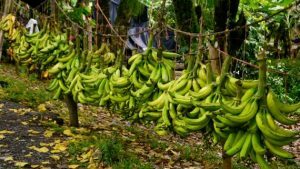 Thus, the analysis suggested that in most cases, RA certification for banana farms does not make a significant difference in conserving forests in Costa Rica. That said, further research is needed to account for certification date, farm area, and self-selection. This research indicates a need for further evaluations of certifications like Rainforest Alliance and continued partnerships with the organizations, as well as scientifically-informed amendments to the standards themselves. Furthermore, private food certifications should take a more place-based approach in implementation, utilizing public-private partnerships and producer involvement in decision-making to help localize international standards and increase local ecological benefits, while maintaining consumer trust in their labels. My placement culminated in two internal papers on these topics and a research presentation as part of the PLACE seminar series. I am grateful to Dr Angelina Sanderson Bellamy and the Sustainable Places Research Institute for providing a welcoming research environment and the opportunity to explore some of today’s most pressing sustainability challenges. Thank you, PLACE!